Put your old car to work! 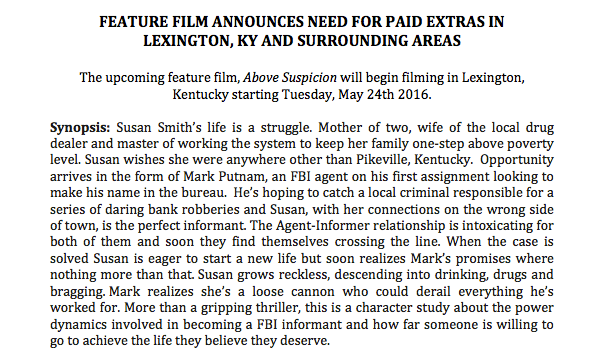 The movie “Above Suspicion” is now filming in various areas of Kentucky and they are casting talent for paid movie extra roles. “Above Suspicion” is filming in the Paris, Kitts & Lexington Kentucky areas this June and is in need of 70s and 80s cars. Specifically, the years they are looking for is 1970 through 1985. The movie has scenes set in the 80s and is hoping to find locals with cars to match that period. These are paid roles and your car may be able to make you some extra cash for a day or two. The production is seeking running cars only and cars may not be a bright color such as red or white. The production also promises that your car will be OK and the only person driving it will be you (chance for you to be a movie extra as well.) This post has also been updated to include upcoming paid extras roles as well. See the available roles and details on how to submit below. “Above Suspicion” will began filming in Lexington last week and is scheduled to film in Lexington, Kentucky and surrounding areas all through June. ”Above Suspicion” stars Emilia Clarke and Jack Huston. The movie is a period piece based on the story of FBI agent Mark Putnam and a Kentucky woman who became his informant. Putnam received national attention when he confessed to killing his pregnant informant girlfriend in 1989. He went to prison and was released in 2000 after serving 10 years for killing his girlfriend. The film needs extras 18+ as well as cars between the years of 1970-1985 that may be used on set. Interested in being an extra on “Above Suspicion?” See Casting Call in Lexington Kentucky for Upcoming Movie “Above Suspicion” for all the extras casting details. KITTS, KY: NEEDING THE FOLLOWING EXTRAS FOR TOMORROW, JUNE 24th! FBI AGENT: Males, all ethnicities, ages late 20s, 30s, 40s, and 50s. The men submitting must be clean-shaven or close to clean-shaven (neatly trimmed mustaches are okay.) Those submitting must be able to provide their own business attire, consisting of but not limited to: Suits, Slacks, khakis, skirts, button-ups, blouses, ties, belts, and closed-toed shoes. This is a period piece (80s) so we prefer if those submitting do not have a clean-shaven head. SHERIFF: Caucasian, males ages 30s and up. Those submitting must be clean shaven and wear a pant waist size of 34, 36, 38, 40 to 42. TROOPER: Males, all ethnicities, ages 30s and up. Those submitting must be clean shaven and wear a pant waist size of 32, 34, 36, or 38. We always ask that you be available the whole day and able to work 10 plus hours. The pay is a guaranteed $58 total for up to 8 hours and time and a half after 8 hours. The e-mail should include a recent photo (headshot), height, weight, wardrobe sizes, location, description of any tattoos, and contact information. HARLAN, KY: LOOKING TO FILL THE FOLLOWING ROLES FOR SATURDAY, JUNE 25TH! FBI AGENTS: Looking for males, any ethnicities, ages 30s and up. Those submitting must be willing to be clean shaven (or close to clean shaven, mustaches are okay.) You must be able to provide your own business professional attire. We also prefer if those submitting do not have a modern day hair cut such as buzzed-cut sides. PIKEVILLE SHERIFFS: Looking for caucasian males, ages 30s and up. Those submitting must be clean shaven and wear pant waist size of 34, 36,28,40,42 or 44. We also prefer if those submitting do not have a modern day hair cut such as buzzed-cut sides. STATE TROOPERS: Looking for caucasian males, ages 30s and up. Those submitting must be clean shaven and wear pant waist size of 33, 34, 36 or 38. We also prefer if those submitting do not have a modern day hair cut such as buzzed-cut sides. DOCTOR/ORDERLY: Looking for caucasian male, ages 30s or up, would love to have someone with REAL medical. Those submitting must be clean shaven or close to clean shaven, mustaches are okay. We also prefer if those submitting do not have a modern day hair cut such as buzzed-cut sides. NURSE: Looking for a female, ages mid 20s or up, we prefer if those submitting have experience as a nurse or have some sort of medical experience. HOSPITAL PATIENT: Looking for a male or female, any ethnicity, ages 20-80. We always ask that you be available the whole day and able to work 12 plus hours. The pay is a guaranteed $58 total for up to 8 hours and time and a half after 8 hours.